You know those moments where you just happen to be prepared at the right place, at the right time? That happened to me the other day. I had taken my camera out into the yard to try to capture some photos of the Chipping Sparrows that have been hanging around in the garden, so I had the long lens on it. I haven’t put the long lens on the camera in weeks and weeks. After the chippers had flown I walked with Raven down to the vegetable garden on my regular garden round, to see how the produce is doing. By this point in the season there’s not all that much to see, since other than the tomatoes we didn’t have any late-maturing veggies planted. Still, I strolled down anyway. Halfway down the path, I glanced out over the open field to the north – the area around the house is enclosed by trees so sightlines are short – and a Cooper’s Hawk was cruising south along the field, low, perhaps only 20 feet (6 meters) high. And I was there, with my camera turned on, with my long lens attached, with the lens focused for 20-feet-away birds, and I saw it coming, so I was able to lift the camera up and rapidly shoot off four frames as the bird passed nearly directly overhead. And two of them actually turned out. Wow. Talk about serendipity. This is the first Cooper’s Hawk I’ve seen at the new place. It’s not a species I typically see a lot of to begin with. They’re not uncommon, they’re just not abundant. They also tend to be more quiet and secretive than many other raptors that we’re familiar with, such as the Red-tailed Hawk. While the Red-tail is primarily a meadow-hunter, the Cooper’s generally sticks to forests, making them difficult to sneak up on, and darn near impossible to spot at a distance. They are incredibly agile flyers, able to squeeze through narrow spaces in dense forests by flapping in the open bits and then pulling their wings in tight to their body to shoot through small gaps like a projectile, or twisting to fly sideways like an airplane doing a stunt. They use their long tails as efficient rudders in these high-speed maneuvers. Despite its traditional preference for dense woodland, the Cooper’s has adapted well to city living, and can now be found in many urban centres, such as Toronto, in higher densities than it is in its natural habitat, likely due to the great availability of avian prey. It still prefers a patch of trees or small woodlot in which to build its nest, however. It’s almost identical in appearance to the related but smaller Sharp-shinned Hawk. The males are smaller than the females in both species; small male Cooper’s can overlap in size with large female Sharp-shins, so size in and of itself isn’t always a reliable indicator, especially without any sort of reference point. There are two things that are useful for telling the two apart, though. If you’re lucky enough to see it soaring, like this individual was, the way it holds its wings is diagnostic – the leading edge (the front edge) of the wings will line up in a straight line in Cooper’s, while Sharp-shins tend to hold them slightly forward so they form a gentle curve around the head. If the bird is sitting and you can see the face (or even if you get a really good look in flight, like this), Cooper’s have a heavy bill relative to the size of the head, and heavy brows, giving them a fierce look. Sharp-shins, by comparison, have a small bill and reduced brows and look much daintier. This individual is a hatch-year, that is, born this summer. It’s probably no more than three months old. You can tell its age by its brown plumage and streaky breast, as well as the yellow iris. In adults, the back is grayish and the breast striped with rusty orange. The iris of the adult is likewise a rusty orange. What a serendipitous moment! Great shots. Thanks! It sure was a lucky opportunity. Great shots of the Cooper’s Hawk. 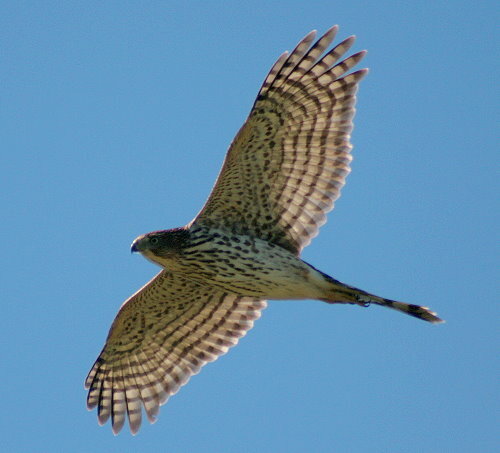 I just saw a young accipiter fly through the garden for the first time in a while. It took a shot at the bird feeders, missed, and then moved on. Thanks, John. It’s a cool experience to have one of these birds visit your garden. I wouldn’t mind one hanging around and hunting the birdfeeders, but even when they do come they never seem to stay. Lucky moment. 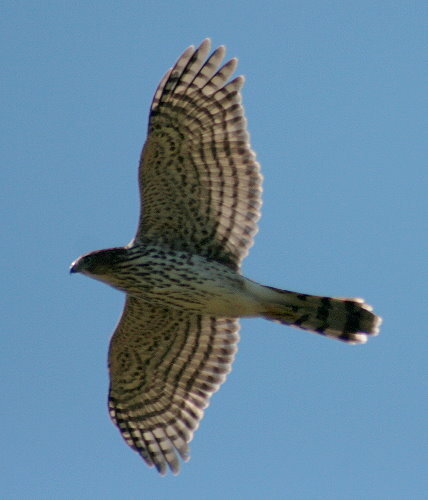 Very nice photo of a young Cooper’s Hawk. I’ve always wondered how this raptor got it’s name. Any idea? Thanks. The guy who described the species initially, Charles Lucien Bonaparte (nephew of Napolean), named it after William Cooper, one of the founders of what is now known as the New York Academy of Sciences. A lot of species get named after friends of the person describing it (perhaps because it seems too egotistical to name it after yourself?). Wow Seabrooke, extraordinary captures of this quick and agile bird in flight! As you describe, their aerial acrobatics through the trees are amazing. I always feel special when I experience something like this and I’m able to capture the moment on film. Thanks for sharing your trip to the garden and the excitement of the capture.